While we’d never take our chic pointed pumps out of our full Monday-to-Friday rotation (Carrie Bradshaw would be horrified), we’d happily acquiesce to a high-heel hiatus now and then. Because let’s face it—most work days we just want to be comfortable at the office while still looking professional. That’s where these flats come in. They’re practical and polished, the kind of shoes you want to walk in, work in, and have a sneaky after-hours cocktail in. From suede loafers to laceless oxfords and slip-on mules, scroll below to see our Citi Bike–friendly flats that are positively work-appropriate. 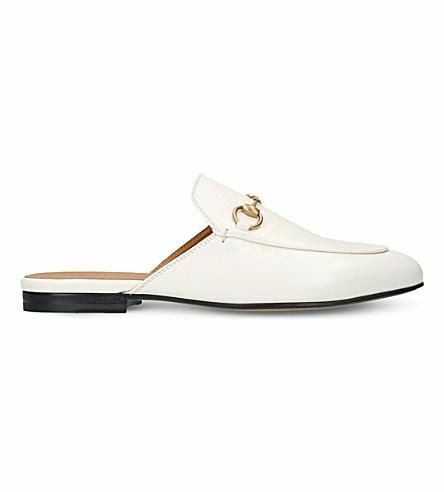 Slip-on loafers have won our hearts for some time now, but when they come in ultra-chic white? We become obsessed. Be the coolest girl in the office in these edgy-meets-luxe showstoppers. Professional at the front, playful at the back. For a classic option, you can't go wrong with black suede. They work with everything from a sheath dress to sleek cropped pants. Soft suede loafers paired with clean cropped hems are a match made in work heaven. Get ahead of fall's tweed trend and opt for prim and polished mules. Ballet flats you can wear with literally everything. Cocktails after work? These luxurious velvet slip-ons will take you from day to night in seamless style. Stand strong in the boardroom in comfortably cool borrowed-from-the-boys brogues. You can never—with a capital, snappy N—go wrong with a pair of classic Chanel flats. These will seriously last you a lifetime. Expect endless compliments in these plush satin-velvet stunners, especially when worn with this season's gray check skirt suit. These will easily become the staples of your summer-to-fall wardrobe. Silvery suede exudes smart sophistication. For those who work in more creative offices, these trendy floral flats are sure to ignite your imagination. Up next, proof you can wear these $35 shoes with everything.